If you haven’t noticed by now, RevZilla takes video seriously. We strive to provide the most killer productions the moto world has seen and part of that includes using the best gear. Enter the GoPro Hero4. GoPro boasts another iteration to the Hero line with changes to the physical design, software, and feature set. As a power user of the GoPro Hero3+ Black, I put the Hero4 Black and Silver through our daily grind to see if they have the chops to join our team, which might help you decide if one, or both, should join yours. This video illustrates some of the Hero4's features, which I'll explain in more detail below. We knew it was coming, but didn’t want to admit it. After a good run of the Hero3 and Hero3+ with compatible batteries, the Hero4 Black and Silver have been redesigned. Instead of a detachable door, there is now a hinged door that houses a more slender battery. The batteries will remain the same price as before, at $19.99 a pop. I have to admit, I do like the attached door. It’s solidly constructed and it’s one less thing to lose while you’re runnin’ and gunnin’. Hinged battery door means one less thing you're likely to lose. Photo by Ryan Schultz. The WiFi button functionality has been retooled, as well. It now acts as a quick access button for settings, but will still turn WiFi on and off by holding it in for two seconds. It also becomes a “tag” button with one press during video recording, to mark memorable moments. These tags are recognized in the GoPro App and GoPro software so you can easily access them later on. The Hero4 Silver now has a touchscreen. Photo by Ryan Schultz. A final change worth noting is the addition of a touchscreen LCD to the Hero4 Silver. 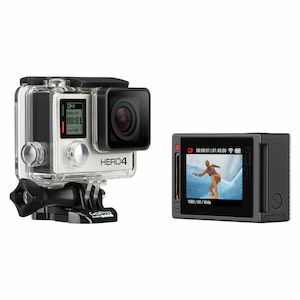 The overall dimensions remain the same for compatibility with accessories, but this feature allows previewing and reviewing photos and video without attaching a stand-alone GoPro LCD Touch BacPac. I find this extremely useful when framing up a shot and locking the camera down, but I did find a drawback that I’ll touch on later. GoPro has made changes to the menu that make it quicker and easier to navigate. The Hero4 now lists mode-specific settings within each mode (Video/Photo/Multi-shot), which means less time button pushing and more time capturing canyon carving. The Hero3+ listed these settings together within a separate “Settings” mode. The Hero4 “Setup” category is now reserved for general camera settings. The addition of the Settings/Tag button makes it even quicker to make changes on the fly. In terms of firmware, be sure to update ASAP! Our GoPro Hero4 Black and Silver were missing some time-lapse features out of box. Now down to the nitty gritty. Perhaps the most significant change moving from the Hero3+ Black to the Hero4 Black is the ability to shoot in 4K at 24 fps or 30 fps. The Hero3+ allows for 30 fps in 2.7K, but only 15 fps in 4K. What does this really mean? More resolution and the image is larger. Now, when I put the Hero4 4K footage scaled to 1080p side by side with the Hero3+ footage, the difference is negligible unless greatly scaled. The real world usability is being able to crop the image and retain quality or, when using an outlet like YouTube, to upload in full 4K. I rigged the Hero4 Black to my helmet and got some test shots on the road. When viewing in 4K, the results were simply stunning. You can check out the quality in the video posted below. This capability, combined with the noticeably sharper image that the Hero4 Black has over the Hero3+, creates a crisp, highly detailed image. Keep in mind that when shooting in 4K, GoPro only allows you to shoot in 4K SuperView or at the wide field of view setting. Image from a Hero4 Black mounted on the motorcycle's windshield. Photo by Ryan Schultz. Image from a Hero4 Black mounted on the rider's helmet. Photo by Ryan Schultz. Many have been boasting the low-light abilities of the Hero4 Black and Silver. However, there is still a significant amount of image noise at high ISO, similar to the Hero3+. No matter how many tests I did with and without ProTune, I wasn’t able to pull off the same low-light results GoPro has been releasing in their videos. I actually found the Hero3+ low-light footage more desirable. The grain was smoother than with the Hero4 Black. I’m eager to see the results others get as more and more Hero4 footage rolls out. The Hero4 Black now has the ability to shoot 120 fps video in full 1080p HD. That allows for smooth slow motion at about 25 percent the speed of real time. The Hero3+ could do 120 fps as well, but only in 720p. 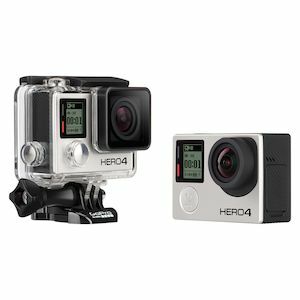 Like the Hero3+, the Hero4 Silver is limited to 120 fps in 720p. Naturally, Lemmy and I took the Sporty out for a quick burnout to illustrate the 1080p slow motion. They pay me to do this? The Hero4 Black also offers 240 fps in 720p, but only with a narrow field of view. Low-light photo capabilities are impressive. Photo by Ryan Schultz. One more standout feature is the photo capability of the Hero4 Black and Silver. While low-light video of the Hero4 leaves something to be desired, the image quality of photos in low light is impressive. Combining this asset with time-lapse achieves professional-grade results. I shot a time-lapse at RevZilla HQ from dusk to sunset, leaving the camera on auto shutter mode. It was able to handle the transition from day to night similarly to a DSLR that would have taken a pro photographer to set up. ProTune is now available for photo mode, as well, allowing for control over settings such as white balance, color, and ISO. GoPro even recently released a firmware upgrade to enable a Video Time Lapse mode. You have a little less control over certain settings and sacrifice some quality when compared to Multi-shot Time Lapse mode, but the GoPro will compile the time lapse for you as it’s being shot, with no post-processing necessary. That’s an incredibly valuable feature for the average user. While 4K looks remarkable and is a great step forward, it might not be useful to some users. Without the right equipment, it can be difficult to work with 4K. File sizes are much larger than 1080p, so storing them can become a challenge. Even previewing and editing the clips on our monster RevZillaTV editing machines proved to be a daunting task. Battery life is sacrificed when shooting in 4K, too. Rhino Camera Gear did a great test comparing the battery life of the Hero3+, Hero4 Black, and Hero4 Silver. The Hero3+ and Hero4 Silver were neck and neck, ringing in at about 120 minutes of recording time in 1080p. However, the Hero4 Black lasted about 95 minutes in 1080p, and only 75 minutes in 4K. Moral of the story: Be prepared to purchase some extra batteries. Last, when I was initially setting up the Hero4 Black, I had significant difficulty connecting the camera to the GoPro App on my iPhone 5. Be sure cellular data is enabled for the GoPro App. Otherwise, the image will only preview if the phone is in airplane mode. A quick note on the Hero 4 Silver, as well. Being able to preview your shot without the use of a separate LCD bacpac is incredible, but don’t expect to reference your shot hands-free. After 60 seconds, the LCD screen dims, a setting that can’t be changed. I imagine it saves you some battery life, but I would like to have the option to change the setting. If you tap the power button, it will brighten the screen back up for another 60 seconds. All in, GoPro has done it again, creating a camera that pushes the limits of technology and allows you to capture your adventures in greater clarity. So which one should you choose? You should probably buy a Hero4 Black if you’re a power user who has a need to shoot in super high-res 4K video and 1080p slow motion. If you’re a more casual user, you might be more interested in the Hero4 Silver, which is still feature-heavy and offers the convenience of an integrated touchscreen LCD. Don’t let this article stop you from doing your homework, however. Sony is developing some impressive image stabilization with its Action Camera and Sena has now entered the world of video with the Prism and 10C, geared specifically toward two-wheeled addicts. Keep your eyes peeled for my upcoming reviews and video tests on those, too. For now, we’ve added a few Hero4 Blacks to our arsenal as we roll out some more bike reviews this year, so expect to see some more killer video by RevZillaTV. What about you?